Gavin O’Connor’s movie, Warrior, tells the timeless story of the underdog who struggles to defeat the odds. The heart of the movie is the relationship between two brothers and their recovering alcoholic father and mixed martial arts serves as the backdrop as this drama unfolds. People studying film production via online college classes will find this one to be an inspiration. 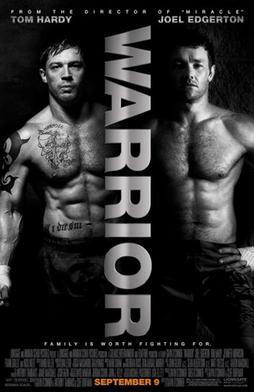 Although, the plot is somewhat predictable, the powerful performances by its stars make Warrior a success. Tom Hardy plays Tommy, a young troubled war hero. He returns home angry and bitter after being away for almost fifteen years. Hardy is excellent in this role, and the torment he feels from his past tangible. You can see the pain and anger in his eyes but most importantly in the way he fights. On the other hand, his brother Brendan, played by Joel Edgerton, has a boyish quality about him. He is a former UFC fighter who left fighting to raise a family and teach high school physics. With the bank threatening foreclosure on his house, Brendan returns to the cage and enters Sparta, a winner takes all MMA tournament. It is here that Tommy and Brendan are forced to face one another and battle the demons from their past. Nick Nolte is brilliantly cast as the tough but loving father, who has found God and put the bottle down. He wants to repair the relationships with his sons that were ruined by his drinking. Fighting gives him this opportunity. Warrior is a movie that everyone can enjoy, not just MMA fans. However, since it was made by mainstream Hollywood, it is not completely realistic. But fight fans will appreciate how the movie attempts to make MMA authentic. From the strategically placed Gracie versus Shamrock poster hanging in the gym, to the cameos by the likes of John Anik, Stephan Bonner, Rashad Evans, and Nate Marquardt. Punkass and SkySkrape of TAP OUT also make plenty of appearances but the phrase “tap him out” is a bit overused. Despite all of its clichés, Warrior is an extremely entertaining movie. It has moving performances, great fight scenes and MMA is shown in a positive light. Mixed martial arts is the fastest growing sport in the world, and in Warrior it has the power to mend broken families and change lives. Warrior premiers in theatres on September 9th.